Listened on commute. Resonate with a lot! Can you be a software craftsman and not test? Scott Nimrod says no! Carl and Richard chat with Scott about his experiences using TDD practices to build software and how that affected his approach to craftsmanship. Scott talks about h.ow writing testing code to quickly test your app code is a far more efficient use of time compared to repeatedly compiling and running an application, then manually navigating to the feature in question and playing with it. Proper tests are faster, more accurate and repeatable, resulting in better code. And they’re even more important when the app gets bigger, the number of developers increase and time passes – build your software right! This entry was posted in .NET, Career, IT, Programming, Testing on June 20, 2016 by healthncode. Hi. This post is going to be short and sweet. Just made a video overview on Visual Studio.NET Debugging – Parallel Stacks and Tasks. Hope that’s helpful if you’ve never used them before. This entry was posted in .NET, Programming, Tips and Tricks, Visual Studio and tagged Debugging, Testing on October 21, 2015 by healthncode. I’ve heard of 9 myself. DefaultValue and WeakReference were examples of ones I didn’t know. This entry was posted in .NET, Tips and Tricks on September 28, 2015 by healthncode. Top 10 C# 6.0 features – external link. This entry was posted in .NET, Programming on September 18, 2015 by healthncode. Hi all. I hope everyone is making their day great. I had a scenario where the Watch value of an expression was valuable to see during the recursion of a function. 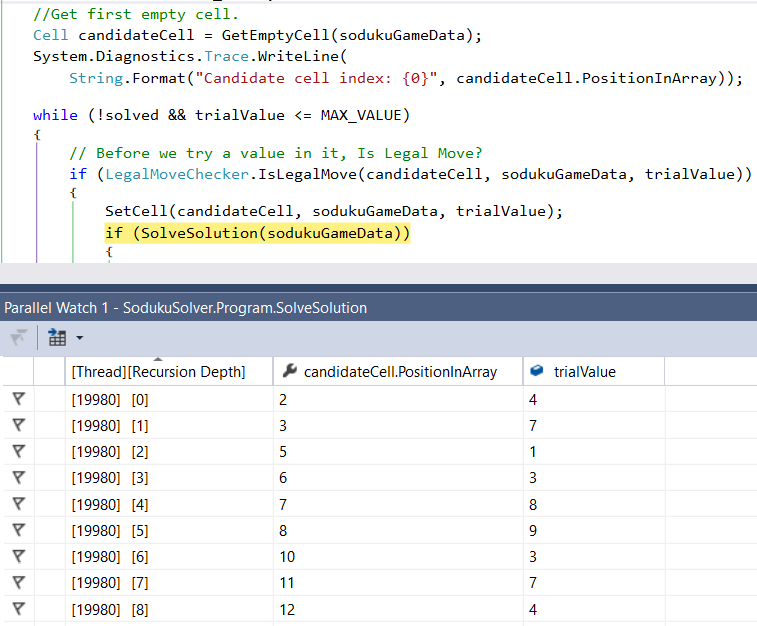 I had a recursive SolveSolution function and it worked with continuously getting the next empty cell and plugging in a trial value in that to see if it was a legal move. The Parallel Watch window is a great tool in this manner. You can add several watches and they each go in as a column value. Here’s a screenshot to follow along into the recursive method. Take note of the Recursion Depth value as well. Using the output of this tool, the application bug that I’d remaining was a lot easier to resolve and resulted in a quicker resolution. Hope this helps! This entry was posted in .NET, Programming, Visual Studio and tagged Debugging on September 4, 2015 by healthncode.